From the Isle of Skye to the Isle of Wight, thousands of UK households are already beneﬁting from reliable, renewable heating with Ecodan air source heat pumps from Mitsubishi Electric. Ecodan air source heat pumps can lower your running costs, lower your carbon emissions and make you eligible for Renewable Heat Incentive (RHI) payments. Ecodan air source heat pumps are classiﬁed as a renewable energy source because they capture free energy from the air. Ecodan works by sitting outside your home and extracting warmth from the outdoor air. Ecodan technology upgrades this renewable heat energy and transfers it inside the home to provide hot water and heating for radiators and / or underﬂoor heating. Find out how a recent Mitsubishi Electric air source heat installation has improved comfort and reduced running costs in a family home in Gayton, Kings Lynn. "Air source heat pumps, we feel, oﬀer a hassle-free alternative to gas, particularly when there is no gas in the area." “The way we design, build, heat, power and recycle our home needs to change and change quickly as renewable heating is an important part of our future. I’m therefore delighted to associate myself with the market-leading brand of heat pumps which are built here in the UK and which can help reduce energy bills and lower emissions for almost any home." The Ecodan Selection Tool provides you with an indication of the potential cost saving beneﬁts of installing Ecodan in your home: including total running costs, carbon emissions as well as the all important RHI ﬁgure. 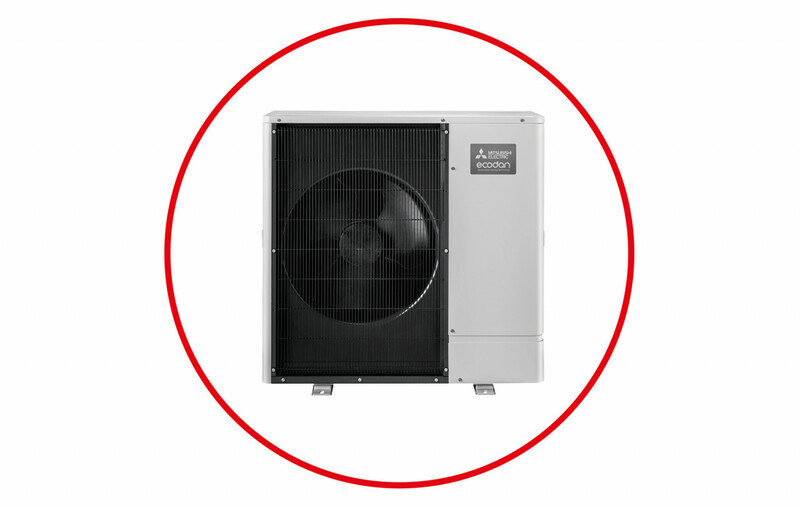 Mitsubishi Electric has developed the advanced range of Ecodan air source heat pumps over the past decade to deliver a variety of choice for homeowners, regardless of location or property type. To leave an enquiry, please fill in the short form on the right hand side and a member of our heating team will get back to you shortly.